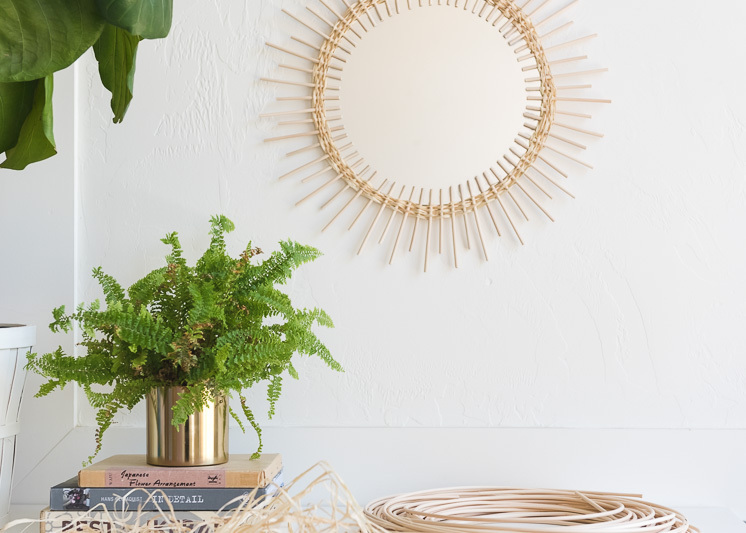 Sunburst mirrors are definitely having a moment and I’m all about it. You’ve probably seen them popping up around the design world, I’ve got one in my kitchen! I happen to love rattan–furniture, accessories, you name it! 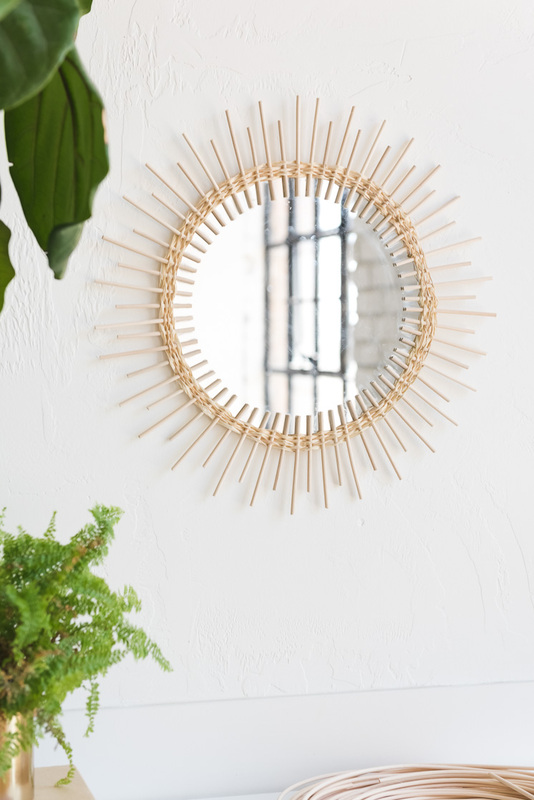 There are lots of beautiful rattan mirrors out on the market right now, including lots of vintage beauties! 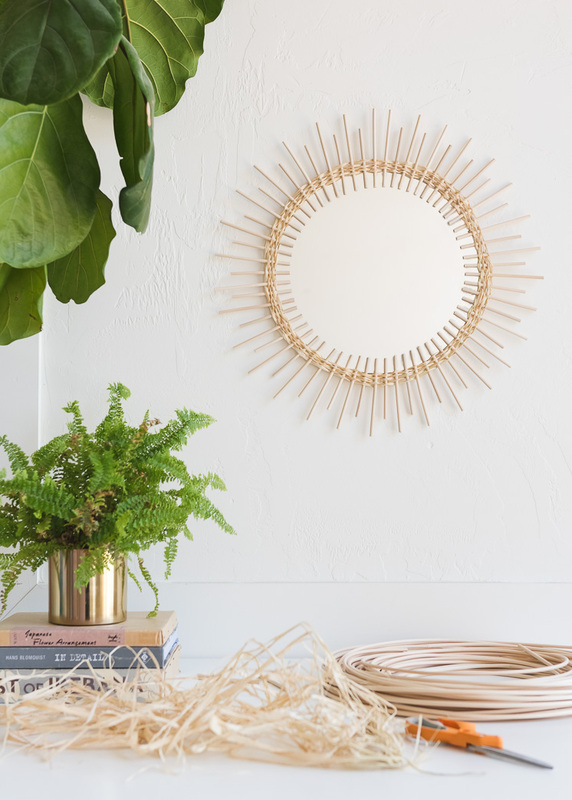 They can cost a pretty penny though so we decided to make this DIY Rattan Sunburst mirror for only $25! And that will allow you to make 2-3 mirrors! It’s much easier than you’d think and the end result is so stunning, no one would ever guess you made it. So let’s make some mirrors! 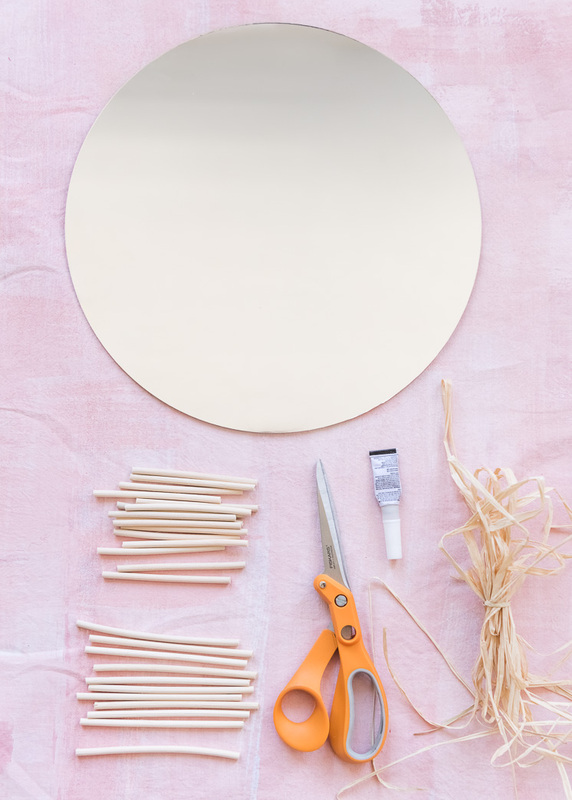 Take your reed and cut out pieces in two lengths: 3.5-inches and 4.5-inches. Feel free to adjust the lengths to your personal preference! Cut 35 pieces of each length. This will give you enough (you might have extra) to surround the circumference of a 12-inch mirror. If you select a larger mirror, simply cut more pieces. Once all your pieces are cut, soak them in a water bath for up to an hour. This will straighten the pieces since they’ve been curved into a coil. Remove the reed pieces once straight and let dry for a few hours. Take a 4.5-inch reed and add some jewelry glue to one end of the reed and place on the edge of the mirror, about .5 inches into the mirror. Press and hold firmly onto the mirror for 5-10 seconds. Then take a 3.5-inch reed and glue about 3/8 or 1/2-inch away from the previous reed. 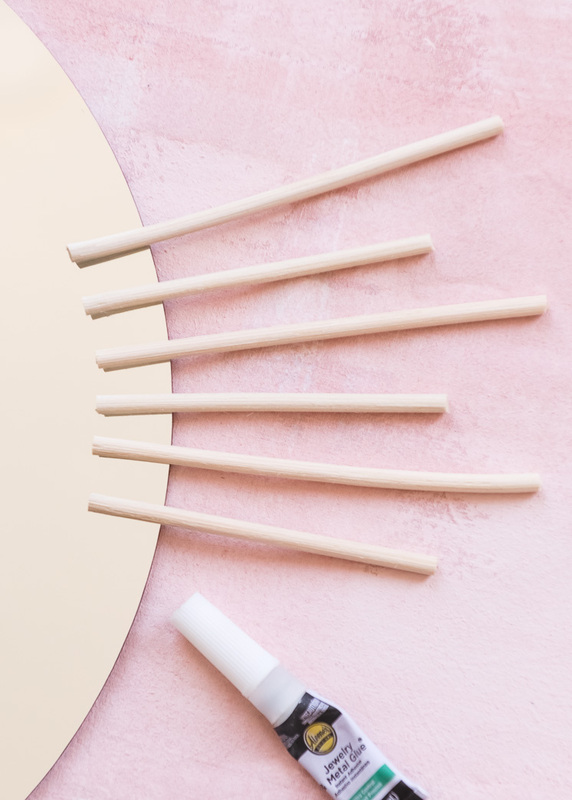 Repeat this process, alternating the reed lengths all the way around the mirror. Let dry for at least 2 hours or overnight. 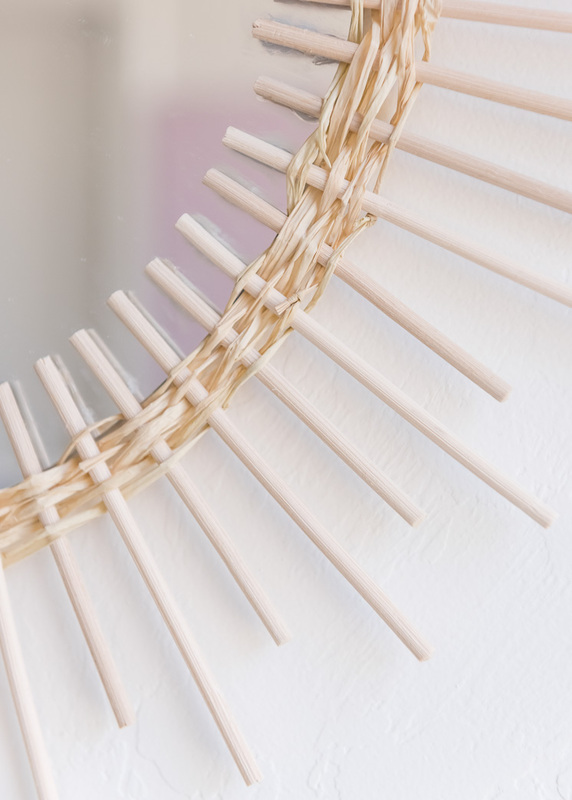 Once dry, take your raffia and weave between the reeds going over one and under the next, repeating all the way around the mirror. 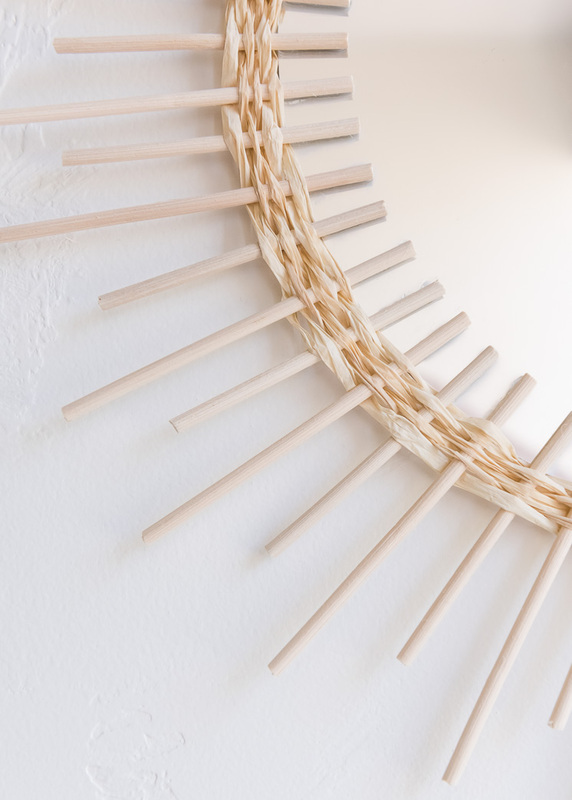 Tie the two ends of the raffia together and trim the ends. Once you go around the mirror, go around a second time, this time going under the first one and over the next, so the weaving pattern is opposite from the first. See the photos below! Repeat this pattern until you go around 5-6 times. Voila! Hang up your mirror and celebrate the job well done! 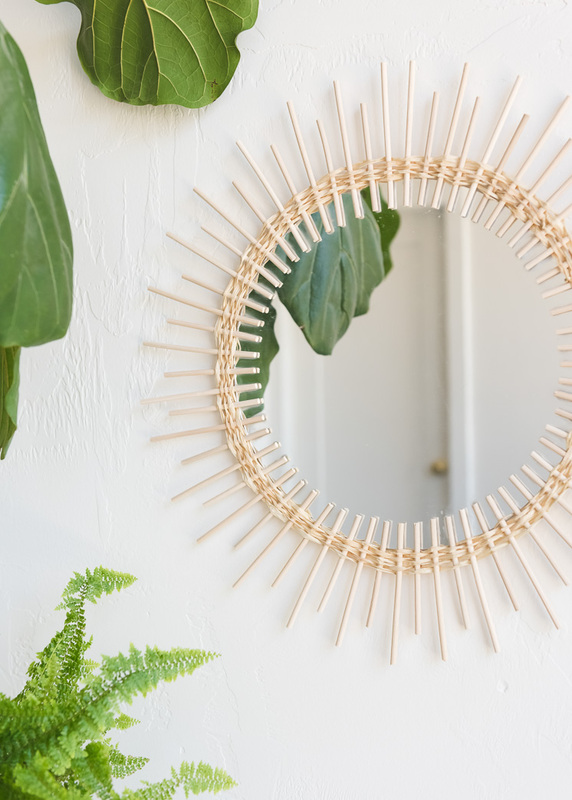 Awesome rattan sunburst mirror DIY project. Have to try this out.